All smiles: Kennedy Parks smiles after several missed attempts at hitting a free throw. 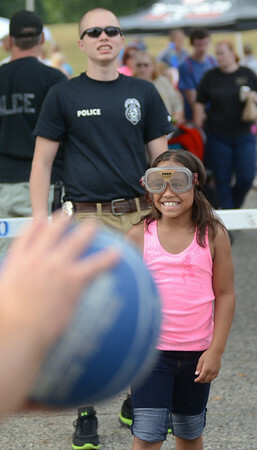 She was wearing goggles made to simulate vision impairment caused by too much alcohol in the system. HElping with the booth at teh National Night Out was Indiana State Police Department’s Andrew Piske.